Welcome to the Mukhopadhyay group site! Some news from lab.. Always looking for postdocs and students with interest in microbial signaling and Host engineering. Contact Aindrila! Our discovery of large plasmids from the Oak Ridge FRC, spanning many incompatibility groups and many interesting functions is ONLINE!! Congratulations to Ankita Kothari and the team. Really pleased to have this out as it sets the stage for a lot more on this topic! Our review on what we view to be challenges in engineering robust strains for large scale applications, and how Systems + Synthetic Biology can address them. Kudos to Maren for taking the lead on this! Read Online!! 2018 ended well for our team. We started the new year with the very first M-group retreat at the UC Faculty Club. It was a really fun day with interesting discussions on science, careers and some very fun team activities! Congratulations to Jadie and Albert and their mentors Maren and Ankita for winning the best poster and best presentation competition. A special thanks to Drishti for her very cool poster also! And a shout out to the JBEI and ENIGMA projects!! Our paper examining the role of an essential gene in improving not only tolerance but also restoring production levels in the presence of biomass pretreatment reagents is out in Microbial Cell Factories!! Check out the Open access paper here! Proud of these two bright researchers going off to grad school this fall. Congratulations to Jess and Robin on their acceptance to Riverside and Cal! Our study on two component signaling cross-regulation is out in Molecular Microbiology! We used the DAP-seq method that Megan has developed and presented at the recent Gordon Research Conference. Congratulations to Megan and the whole team! Read Maren’s interview with BD Biosciences about the Accuri! Our one pot jet-fuel research got a mention in a popular science book! Woo hoo! Thanks to Kelly Weinersmith! We published our paper in developing a synthetic transcriptional factor – hybrid promoter library for use in S. cerevisiae strain engineering. Our study on improving membrane protein expression using genome wide edits is out in Scientific Reports! DOE announces funding for JBEI other BRCs! Looking forward to many more years of research with a great team! Duy presented her undergraduate work at the JBEI undergraduate Seminar! We loved having her in our group, and her research with Lara and Megan focused on understanding copper responsive systems in denitrifying Pseudomonads. She is a master of RNAseq preps! Congratulations on a great talk Duy!! Ankita’s study on native plasmids from the Oakridge FRC is now online at BioRxiv! Victor’s paper on Engineering glucose metabolism of Escherichia coli under nitrogen starvation is out in Nature Systems Biology and application. Our Cas9 toolkit for yeast is now published online. Read about it on Today at Berkeley Lab. All the plasmids are available from Addgene! Marijke’s paper on combining Ionic Liquid tolerance with biojet-fuel production is our in Green Chemistry and has a great write-up on Today at Berkeley Lab! We lost a year of m-group news updates to grant writing…we may or may not be able to catch-up. But research was good and we published a lot! Lara’s paper out in JBact. We described the role of a two component system in nitrite stress in the obligate anaerobe Desulfovibrio vulgaris. The whole group at Bucci’s with all our visiting scientists and students (and the Bucci dog). Victor’s study on a Limonene tolerant AhpC mutant is out in AEM. A good explanation for why Limonene is so much more toxic than other similar monoterpenes. Congratulations to Victor, Florence and the rest our team!! Michela was part of our team that published two studies on D. vulgaris last year, one on motility genes and the other on cyclic-di-GMP signalling. Proud of Michela Catena who is going to travel to India this fall on a Fullbright Scholarship!! Congratulations Michela! Flo’s paper is out in Biotechnology and Bioengineering A heroic effort in generating an improved pump for a volatile organic compound. We will look to the metabolic engineering community for a hexene production strain to implement this discovery. Jensen, Foo et al 2014 gets a nice write up by Lynn Yarris and was featured on the front page of the DOE webpage! We published our study on improving Isopentenol tolerance and production in the mBio journal. mBio featured it in their blog. We have gotten many more mentions (RDmag, Science Daily, Green car congress…). Congratulations to Heather, Jee Loon and the rest of the team!! Lara’s Microcoleus Desert soil crust paper in online in the ISME Journal! And we get a wonderful article in TABL by Lynn Yarris. We get a chance to talk about our research at the Berkeley Rep at the Science at the theater organized by Friends of the Berkeley Lab! We get a mention in the Department Of Energy feature on STEM profiles. The whole group at the Can’t Fail cafe. We have new members in the group – Amanda Reider Appel and Nhat Than Vuong! Science Today, a UC Berkeley Radio channel, features comments on our study of the D. vulgaris two component system regulator network. Lara and Eric’s Response Regulator Map paper gets written about in Berkeley Lab’s TABL site. Lara and Eric’s D. vulgaris Response Regulator map paper is out in Genome Biology. Zain, Heather and Aindrila feature on the cover of the Biorefining magazine. Here is the article. 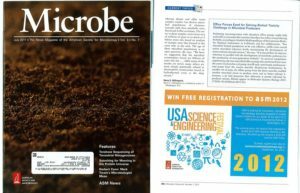 Our efflux pump paper gets a mention in the Microbe magazine. Other mentions of our study are in eureka alert, techblog, science daily, microbeworld, Materials Today to list a few!